AeroBD News…Tokyo, November 02, 2015 : The Oct. 31 crash of Metrojet flight 9268 was only the third hull loss of an Airbus A321-200 and the worst accident so far involving the type. The aircraft was operating a scheduled service from Sharm el Sheikh (Egypt) to St. Petersburg, Russia with 224 people on board, among them 217 passengers. It took off from Sharm el Sheikh airport at 5.49 a.m. local time. The aircraft appeared to be climbing steadily towards its cruising altitude with no unusual speed deviations noticeable until 06.13 a.m. when it was crossing the Sinai peninsula. About one minute before radar contact was lost, massive speed and altitude changes were traced. According to flight tracking website Flightradar24, the last recorded speed was 92 knots at an altitude of 28,375 ft. According to reports from the crash site there were no survivors. An Egyptian official claimed the crew had declared an emergency because of unspecified technical problems and requested diversion to the nearest airport. The Egyptian government was fast in ruling out a terrorist attack. The aircraft was registered under EI-ETJ, built in 1997 as Airbus manufacturer serial number (MSN) 663 and accumulated 56,000 flight hours and 21,000 flights, according to Airbus. It was originally delivered to Middle East Airlines on lease from ILFC and later operated for Onur Air, Saudi Arabian Airlines and Kolavia. The aircraft was powered by International Aero Engines V2500 engines. 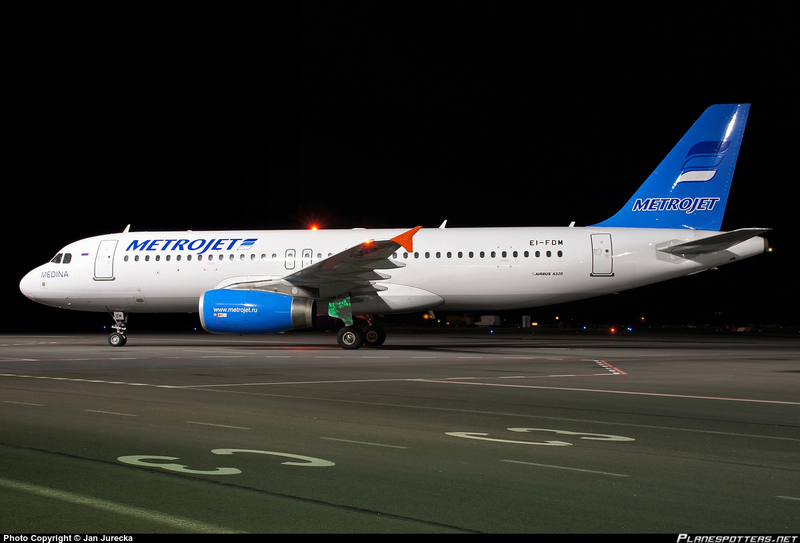 Its last operator, Kogalymavia, operates under the Metrojet brand and is based in Kogalym. The carrier specializes in international charter flying. Among others, it operates another three Airbus A321-200s. In 2010 an Airblue A321 crashed into the side of a mountain during a poor weather approach to Islamabad. All 152 on board died. The only other A321 hull losses affected a Transasia Airways A321-100. The aircraft, delivered in 1996, hit a utility vehicle on the runway while landing in Tainan/Taiwan injuring two construction workers. The aircraft was damaged beyond repair. Other recent A320 family accidents include the Dec. 28, 2014, crash of Indonesia Air Asia flight 8501 for which major speed and altitude fluctuations were reported before contact was lost. There have been 34 hull losses for the A320 family, according to the Aviation Safety Network.